When you picture Santorini, you picture beautiful blue and white domed buildings, black sand and sunshine. And that is exactly what I got when I arrived. Well, not exactly when I arrived as it was more or less midnight when we got off the plane at Santorini airport, but the next morning on our walk around the local area, that was pretty much what we saw. I went at the beginning of September and booked my trip through Solo’s Holidays, who organise holidays for single travellers. Santorini has always been a place I have wanted to visit, so when I saw that Solo’s offered it for a decent price (no single supplements!) at the sort of time I wanted to go, I decided to go for it! Solo’s provide a forum where you can chat to other people who are going on the same holiday as you or who have been before and can tell you a bit about what to expect. This was quite useful and meant that I had introduced myself to a few people before we got there and agreed to meet at the airport before we travelled. We flew from Gatwick with Norwegian Airlines, which was a bit of a chore for me to get to, even more so when I flew back home! Not 100% sure if I would fly with Norweigan again, but I suppose they were as good as any other budget airlines for a short-haul flight. 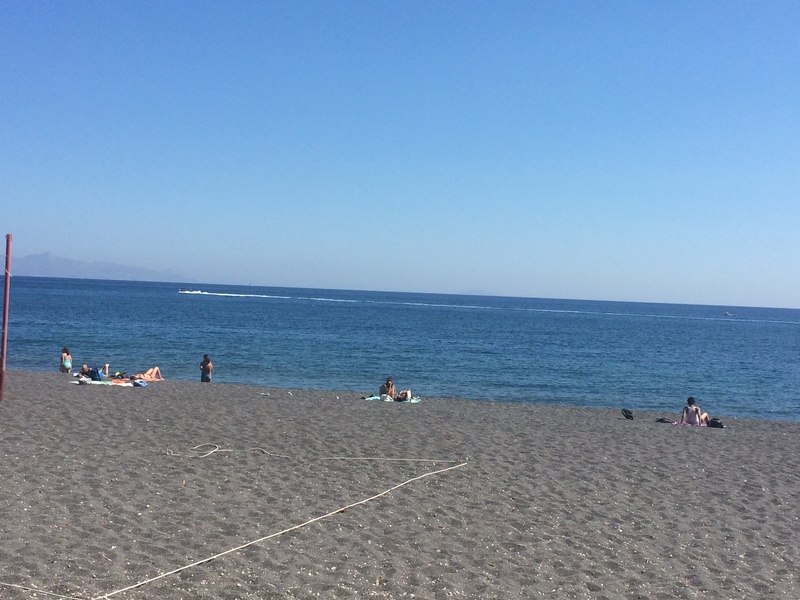 We stayed in a lovely area called Perissa, which is quite famous for its long black sandy beach and is quite a lively place to be, without paying the prices of Oia or Fira and was the perfect location to explore the island. The B&B we stayed in was quite basic, but clean, which is all I ask for nowadays! One thing I did like about Solo’s holidays is that even though there are no single supplements, you don’t have to share a room – something which bugged me a bit when I went travelling. I did a few trips that were organised by our tour rep for ease and to be with people I knew, but if you were visiting with friends/family there are plenty of local travel agents offering a wide variety of excursions on and around the island. 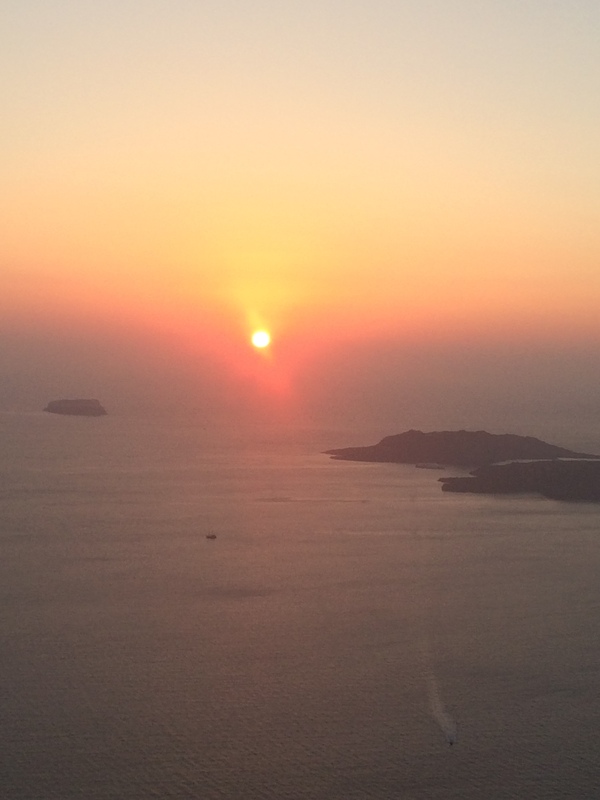 Check out Lucy from Absolute Lucy for her tips on organising a trip in Santorini! I also braved the public bus and took myself off to Oia for the day. Getting the bus from Perissa was pretty easy and I only had to change once in Fira at the bus station, and there are staff all around to let you know which bus is yours. It was lovely to have a bit of time to myself, without needing to be somewhere at a certain time to meet the group. There were so many highlights of the trip, but for a quick overview it was all about the views! The view from the Volcano, the views from Oia, the views from Santo Wines at sunset, everything was stunning! The food, well that was pretty good too! I will do a separate food post, but everywhere I ate and everything I ate was gorgeous! I put on around 10lbs on this holiday!! And it was worth every pound! Lots of fish, feta cheese, pitta bread and fava! Overall, would I visit Santorini again? Absolutely! Would I go with Solo’s again? Yes and I would probably use them to visit other parts of the world too. Keep your eyes peeled for that food post and also some highlights of the trip coming soon! Disclaimer: This holiday was paid in full by myself. Solo’s were not aware that I was reviewing the trip for my little blog!